I am one of those people who grew up in the shadow of a sibling. Like Jan Brady, my older sister was the perfect one; Miss Popularity who got all of the attention, while I was just “Marcia’s” sister. As fate would have it, we both went to the same state college, and enrolled in the same major, Communications, but different concentrations – I chose Public Relations while Marcia went towards Advertising; however, we had a lot of classes together – I couldn’t get away from her. After graduating, I decided to start my career while Marcia decided to continue on to graduate school, thinking it would make her more marketable. It didn’t. In fact, her choice backfired, making her un-hirable in our local market because her education level demanded more money, which local employers did not have to pay. Rather than accept less than she could make elsewhere, Marcia moved to a larger city while I stayed in our hometown. The distance between us actually helped us to grow closer, as Marcia learned what it was like to leave her comfort zone and I was allowed to step out of her shadow. Over the years we have both done well in our chosen career fields and I even went to graduate school, courtesy of my company’s tuition-reimbursement plan. I have married and have a wonderful husband and children. I am truly blessed! Marcia, on the other hand, has taken a different path over the years, one that led to difficulty during the economic recession. Marcia has bounced from one market to the next, never building up seniority at any one place, but reaching for the next rung of her career ladder when an opening became available in a desirable market. In this way, she reached upper management very swiftly, but never put down roots anywhere. She was living in Nevada when the recession hit, and she has not quite recovered from the huge blow she took. After two years of looking for a job opening in a similar or higher position that she last held, her savings are running out and she is talking about moving “home” to look for a job. Tazi, I realize that our hometown has not been “home” to Marcia in over a decade, but I can’t help but feel frightened that her return will threaten all that I have managed to build for myself. I am afraid that I will go back to being Marcia’s sister and all that I have accomplished and all that I cherish will be forgotten. Marcia on the other hand talks excitedly about renewing our sisterly bond and how she can’t wait to be a part of my children’s lives, which worries me the most. What if my children prefer their Auntie to me, just like everyone else used to prefer Marcia to me? I am sure there will be a lot of people who will be able to relate to what you have written. Growing up in the shadow of a sibling can be a painful experience, but luckily – as you have found – that shadow is something we eventually outgrow. Having gone to college and studied the same major as your sister extended your time in that place, but you have bloomed since taking the path that led you to sunshine. There is one sentence in your letter that is very telling of what the future may hold, but you seem to have missed it in your worry of what might happen versus what will most likely happen. You state that your hometown “has not been ‘home’ to Marcia in over a decade”. I would like you to think upon all the changes that have occurred during that time. Who has moved away or passed on? Who has moved into your town? Which of Marcia’s old boyfriends have moved on and married women they could not imagine living without? 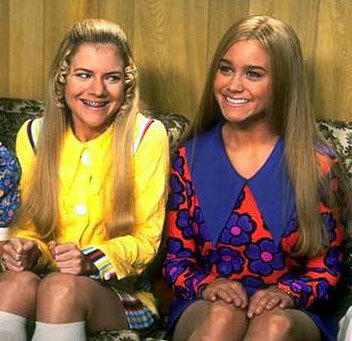 How many of Marcia’s best friends have developed new, adult friendships? Marcia may be moving back to her hometown, but I doubt it is the same town she left all those years ago. Upon arrival, she may discover that she is viewed as “Jan’s sister”. Do your best to overcome any desire to revel in this glory, and try to take a compassionate view by reintroducing your sister to the hometown she left behind. "Wanna see my Linda Blair impression, Marcia?" Regarding your final concern…it is my hope that your children will enjoy the time they spend with their Auntie – times with aunties are supposed to be fun times! Just remember that the love between a mother and child is something unique and that it can never be surpassed; it is not a more or less kind of love, it is a different kind of love that can never be taken away from you.